"Look what he can do!!" Christmas wouldn't be the same without the classic Rankin/Bass Christmas specials. 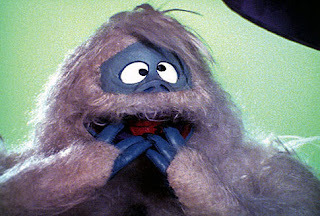 "Rudolph the Red Nosed Reindeer's" Abominable Snowman scared me to bits when I was a kid. Those intense eyes! The fangs! The padded feet! Now, he's just so cuddly and fuzzy, and his comb-over would make even Donald Trump envious. Truth be told, today I'd be more frightened to encounter Sam the Snowman! Now he's a bit creepy! My little girl wasn't too happy about about this abominable snowman trying to eat Rudolph's Clarice! !